This is an interesting video interview with film legend Sylvester Stallone talking about when he was in Brazil filming “The Expendables” and they needed to cast some soldiers. They held a casting call and all that showed up were basically guys that looked like male models. Stallone realizing Brazil was a hotbed for mixed martial arts and some of the sport’s best fighters, had a meeting with the Nogueira brothers and Anderson Silva. They actually put on an MMA event for Stallone not only to watch, but to serve as a type of casting call to recruit the type of talent and look they needed for certain characters in the movie. Stallone found the fighters they needed to serve as soldiers in “The Expendables”, including UFC light heavyweight Antonio Rogerio Nogueira. 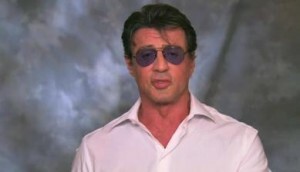 Stallone shares his thoughts on what MMA is all about and you can tell he “gets it.” Pretty cool. “The Expendables” is due to hit theaters on Aug. 13. Strikeforce Challengers fighter weigh-ins set for Thursday at Comcast Arena in Everett, Wash.